I am BEYOND EXCITED to tell you it’s now available at Bandcamp. It’s 13 dollars, NAY! $12.99! Go here to get it, then come back! 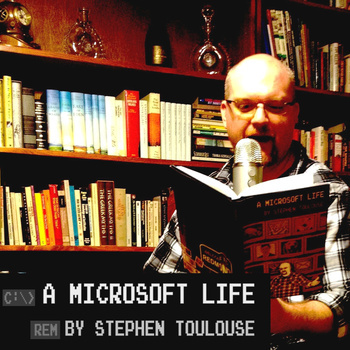 From the moment I released A Microsoft Life people asked for an audio version of it. 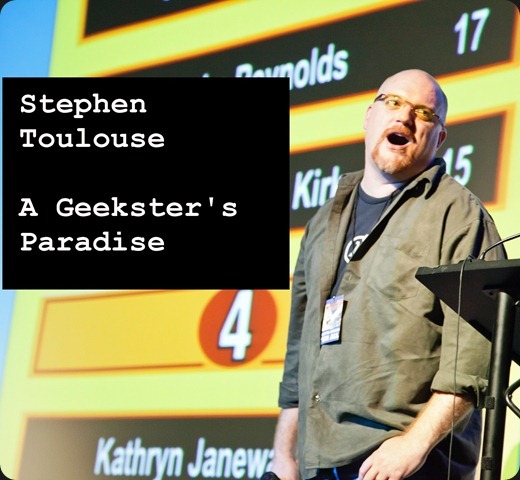 That was fine by me because I have immensely enjoyed actually performing stories from it at spoken word events and at w00tstock. So I invested in some audio equipment (a q-mic personal audio booth and Blue Yeti microphone) and got to recording and learning the ins and outs of producing audio. At the same time, I knew this was going to have to be an abridged version of the book. Some stories in the original work relied on visual gags, and others just didn’t make sense to perform (like some of my speeches, which are widely available on YouTube.) So I picked my favorite stories to perform, and recorded those. I felt a little bad about the audio version having to be abridged, then I remembered “hey! I know a bunch of famous people! I wonder if they would like to contribute!” So I had some very good friends each record a Foreword for the book. I’d like to think that my audio book has the most forewords of any audio book ever. It’s, quite frankly, FOREWORDTASTIC. I created a couple of new content bits, and I wrote BY MYSELF* an original song and all the chapter intro music. Ok, on the chapter intro music I cheated a lot and used Garageband. In addition to the tracks I included an outtakes reel, some scans of the original drawing my friend Mark did for the cover, a .PDF copy of the FULL text of the book itself, and some pictures of Remington. I learned a lot and had a great time producing this edition of the book. I pretty much did it all on my own except for the forewords of course and the final song, so if you spot amateur mistakes then yup, that’s me. I’m an amateur at this. Now this next bit is very important: Two thirds of the proceeds from the audio book will be going to Child’s Play, in keeping with the blog entry I wrote here. Let me say that again, 2/3’s of the proceeds will go to Child’s Play. The remaining third is basically for recouping a little of the money we spent on taking care of Remington. For everyone who originally contacted me to donate to Remington’s treatment, not only can you do that but you can help sick kids as well! I’m handling the donation directly because if I do it that way, Microsoft will match dollar for dollar the amount I donate. I also plan to keep the blog and my twitter updated with the running total to keep me honest and you can see the progress. There’s so many people I want to thank. First of all I absolutely want to thank Mr. John Drake of Harmonix for his audio work, as well as Paul and Storm, Mike Phirman, Wil Wheaton, Len Peralta, Joel Watson and Larry Hryb for their incredibly funny and clever forewords. It was insanely generous for them to lend their names and time to this project. What started out as kind of a funny joke took a more serious turn when Remington got sick, and knowing that their time will most likely result in increased funds to charity makes me feel really really good. As always I want to thank Rochelle, we managed to keep each other sane both during the recording process as well as Remy’s illness. She had to endure periods of time where I had to insist on absolute silence in a house with several dogs and a cat. No easy feat. Lastly thank you guys. Your support during the past two months has meant the world to me. So all this has been really long, I hope your download of the book is complete. It will be appearing on other venues like iTunes, etc at the end of the year. But for right now the maximum return on dollars for charity is through Bandcamp. While iTunes and Amazon MP3 and Zune may be convenient, I urge you to use Bandcamp and add the book manually to your library. The kids will thank you for it. Recipe File: There’s the rub.